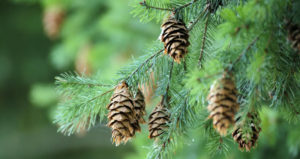 Pygnogenol, a super anti-oxidant that actively prevents premature ageing, is an extract of a very specific pine bark. When ingested or applied to your skin, it’s metabolised into eight incredibly effective anti-oxidants. This gives it the distinctive ability to protect your body and skin from free radicals and lower the enzymes that cause the damage. It also stimulates the production of hyaluronic acid (critical for well hydrated plump skin) and protects the healthy collagen and elastin in your skin. Everyday your skin is exposed to ultraviolet radiation and pollution that result in premature ageing of the skin. Even low levels of ultraviolet radiation can worsen pigmentation, cause facial redness, irregular texture and fine lines and wrinkles. 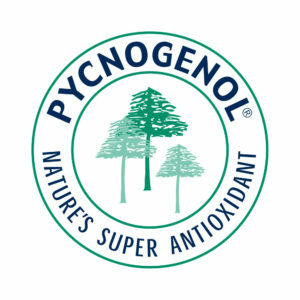 Pygnogenol offers extraordinary protection from UVA radiation and as a result your skin will take a lot longer to become red when exposed to sunlight. This doesn’t mean you can forgo using sunscreen. It’s best to use both – particularly if you spend a lot of time outdoors. 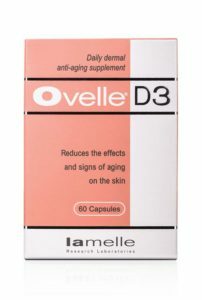 Ovelle D3 is an oral supplement that contains Pygnogenol and activated Vitamin D, and when taken daily, it increases the skin’s resistance to UVA by 80%. More than that – it significantly improves the appearance of Melasma (hormonal pigmentation), and delays premature ageing of the skin. Calcium absorption and the development of healthy bones is dependent on Vitamin D3. Healthy production and action of the nervous system relies on this vitamin and it also plays an important role in building immunity. The body produces this vitamin when exposed to UV radiation but sun exposure ages our skin. An excess of this radiation can even be dangerous to your health. It’s for all these reasons we have included Vitamin D3 in this daily oral supplement. Why would you need to take Ovelle? • In our environment we are exposed to many free radicals from many sources. Our diet unfortunately does not contain enough anti-oxidants to neutralise this threat. Taking Ovelle helps us to balance and neutralise this exposure. • When we have more than normal sun exposure sunscreen on its own might not be enough. Ovelle D3 gives us that extra protection. • If you suffer from hormonally induced pigmentation Ovelle is your solution. You should consider Ovelle if you have noticed a change in the appearance of your skin over the last few years, and wish to improve sun damage and premature aging. • Reduces the intensity of hormonally induced pigmentation. • Enables the skin to protect itself more effectively. • Restores the skin’s natural defence mechanisms. • Reduces the effects and signs of aging on the skin. • Preserve the skin’s collagen. • Improves the skins elasticity and smoothness. • Reduces free radical damage. • Ovelle inhibits the two primary pathways of collagen breakdown as well as specifically binding to and protecting collagen and elastic fibers in the skin. • Ovelle increases the skins resistance to the effects of harmful ultraviolet radiation by over 80% and reduces hormonal pigmentation by 37%. • Take two capsules daily after meals with water.